Whether he admits it or not, Prime Minister Abe Shinzo’s debt of gratitude to DPRK chairman Kim Jong-un is far-reaching—regarding Japanese domestic politics, relations with the United States, relations with South Korea, and perhaps even the future of Japan’s Constitution. First, both the timing and results of the 48th Japanese House of Representatives election of October 22 were significantly influenced by Kim’s threats and actions. Abe’s decision to call the snap election was based on his calculation that the opposition parties in Japan—especially the Democratic Party (DP) and Party of Hope (POH)—were in disarray and that the threat of North Korea’s nuclear weapons development and missile launches would lead Japanese voters to choose the safety and familiarity of the incumbent coalition government of the Liberal Democratic Party (LDP) and Komeito over the new and untested POH or Constitutional Democratic Party of Japan (CDPJ). Abe’s decision to call the snap election, seen by some at the time as a gamble, paid off, with the coalition garnering at least 312 of the 465 seats in the Lower House of the Diet. The outcome in four contested seats is not yet known because a typhoon has delayed the ballot count, but the ruling coalition has clearly secured more than the 310 seats necessary to keep its two-third majority in the Lower House. Second, several factors can be cited for why Abe, virtually alone among leaders of America’s allies, has managed to cultivate a seemingly close and cooperative relationship with President Donald Trump. But an important factor has been the necessity for the United States and Japan to work together in the face of the growing threat from North Korea. It was Kim’s missile launch on February 12, when Trump and Abe were enjoying a golf weekend in Mar-a-Lago, that led to a hastily-called evening press conference in which Trump declared, “I just want everybody to understand and fully know that the United States of America stands behind Japan, its great ally, 100 percent.” Interestingly, Trump at the press conference made no mention of South Korea, nor did he explicitly condemn North Korea’s action. Third, the chilly relationship between Abe and South Korean president Park Geun-hye thawed with the joint statement on “comfort women” issued on December 28, 2015. Although the Japanese government viewed this to be the “final and irreversible” conclusion to this dispute, the inauguration of President Moon Jae-in on May 10, 2017 meant that the issue would resurface because the new government refuses to accept the previous government’s “agreement” with Japan. The Moon government’s stance on this issue, however, has been moderated by the need for South Korea to cooperate with Japan regarding North Korea, and the Trump administration, like its predecessor, has worked behind the scenes to urge Japan and South Korea to set aside their differences on the “comfort women” issue, so that the United States, Japan, and South Korea can work closely and collaboratively to meet the North Korean challenge. On all three fronts—domestic politics, relations with the United States, and relations with South Korea—Abe benefits from Kim’s belligerence toward Japan, the United States, and South Korea. It will be interesting to see how Kim will be used strategically by Abe to realize his most cherished political priority as prime minister—revising the hitherto unrevised Constitution of Japan. When Abe announced on September 25 that he would dissolve the House of Representatives of the Diet and call for a snap election, some viewed it as unnecessary, others as irresponsible, and still others as politically risky. The first group took the position that an election was not legally necessary until next year, and that there was no urgent need to call an election, especially since a reshuffling of the cabinet had just been conducted in August of this year. 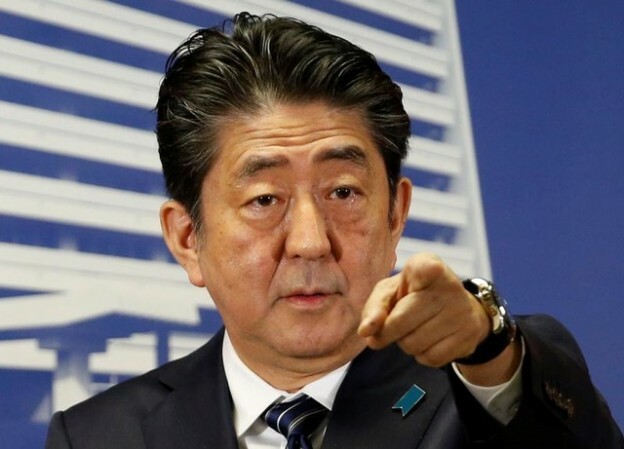 The second group, mainly in the opposition parties, argued that it was irresponsible for Abe to call an election in the midst of a foreign policy crisis posed by North Korea. The opposition parties were also concerned that with the recent establishment of the POH and potential merger of the POH and DP—which could call into question the “progressive alliance” being pursued by the DP with other opposition parties such as the Japan Communist Party (JCP)—the opposition parties would not be prepared to mount a full-fledged challenge to the ruling coalition of the LDP and Komeito. These were, of course, precisely the reasons Abe decided to call the snap election. The third group, including some politicians in the ruling coalition, were concerned that an election could pose a gamble which, if lost, could result in a significant diminution in the number of its seats in the Lower House, perhaps leading to losing the two-thirds majority needed to revise the Constitution. At the time Abe announced the dissolution of the Diet on September 25, it was not clear whether the ruling coalition would win or lose seats in the election. In December 2016, Abe’s popularity surged to 64% immediately after he visited Pearl Harbor with President Obama. Abe’s trip was supported by 84% of the Japanese public and opposed by only 9%. The 64% was the highest support rating for Abe since October 2013. However, in early 2017 the Moritomo Gakuen scandal surfaced, in which Abe was accused of helping a nationalistic school by having his wife serve as “honorary principal” and by influencing a real estate transaction in which the school was able to buy land at one-seventh the assessed value. This was followed by the Kake Gakuen scandal, in which Abe was accused of arranging for a close personal friend to obtain a license to establish a veterinary school. These charges of cronyism were increasing when a string of questionable actions were uncovered regarding Abe’s hand-picked Minister of Defense, Inada Tomomi—her involvement as an attorney representing Moritomo Gakuen, her role in suppressing the release of documents at the Ministry of Defense, her inappropriate statements in support of an LDP candidate for the Tokyo metropolitan assembly, to name a few—which led to her resignation, resulting in criticism of Abe for having chosen such an untested politician to lead a ministry so essential to Japan’s national security in the face of rising threats from North Korea and China. By July, Abe’s support rating had plunged to under 30%. However, the support numbers revived to 50% by September, partly due to the August cabinet reshuffle in which some new faces, such as Foreign Minister Kono Taro and Minister of Interior and Communications Noda Seiko, were brought into the cabinet. The other significant factor that led to the rising poll numbers was the threat from North Korea, with its continued nuclear development and missile launchess. Abe took a calculated risk in announcing the snap election on September 25. But he was quite fortunate that just four days later, the head of the newly created POH, Tokyo Governor Koike Yuriko, announced that her party would “exclude” or “reject” (“haijo”) members of the DP who did not meet a litmus test to join the POH, including supporting the revision of the Constitution. This led the progressive wing of the DP to form a new party, the CDPJ, which essentially ended up becoming the largest opposition party to the ruling coalition, winning 54 seats in the election. The POH, which for a short time was viewed as potentially becoming the largest opposition party, ended up with only 49 seats, with Koike conceding that the results were “a total defeat” for her new party. Trump’s criticisms of Japan—that it steals American jobs, exports to but does not import from the United States, manipulates its currency, and free rides on defense—have been consistent for over 30 years. No wonder that this created considerable anxiety in Japan during the presidential election campaign, and certainly after the election of Trump in November 2016. However, there is in Japan what some term “Trump optimism.” This refers to the view that Trump has ended up taking a rather conciliatory and friendly stance toward Japan, for three reasons: North Korea, economic incentives, and personal chemistry. First is the common adversary, North Korea. The impromptu press conference at Mar-a-Lago on February 12 initiated an intensive dialogue between Trump and Abe on how to deal with North Korea. According to press accounts, Abe is the foreign leader who has had the most telephone conversations with Trump after he assumed the presidency, and in each case the subject was North Korea. Given Trump’s frustration that Xi Jinping is not as cooperative as he had expected in pressuring North Korea to abandon its nuclear and missile ambitions, and given Moon’s background as a human rights lawyer and his conciliatory approach toward North Korea, Abe appears to be Trump’s strongest ally in ratcheting up the bilateral and multilateral sanctions against the DPRK and, in Trump’s words, “keeping all options on the table,” including the military option. Second, Abe and his team have been assiduous since November last year in finding ways to satisfy Trump’s stated desire to change America’s economic relationship with Japan so that it becomes “free, fair, and reciprocal”—the words Trump used in his joint press conference with Abe after their first summit meeting in Washington, D.C. on February 10 of this year. This includes Abe’s proposal of a “Japan-United States Growth and Employment Initiative” under which Japanese companies would invest in the United States to create jobs, especially in the manufacturing sector, which Trump promised during his presidential campaign. Abe knows that Trump, as a businessman, would relish the opportunity to announce business “deals” in Japan and employment and investment in the United States. Third, Abe has consulted with psychologists and Trump’s associates to figure out how best to become his friend. In their first meeting at the Trump Tower on November 17—soon after Trump was elected president—Abe presented Trump with a $4,000 gold-plated golf club (knowing of Trump’s interest in golf) and showed an Instagram posting by Ivanka Trump of her five-year-old daughter Arabella re-enacting a song and dance routine by Pikotaro, a Japanese entertainer (knowing that Jared and Ivanka Kushner would be in the meeting). In addition, Abe told Trump, “You and I have several things in common. For instance, I’ve had the Asahi Shimbun as my enemy, but I’ve been successful in taming the Asahi Shimbun. I hope you will likewise be successful in taming The New York Times.” Upon hearing this, Trump reportedly felt that he was in the presence of a bosom buddy. The Japanese media praised Abe for hitting a “home run” in his first official meeting with the new US. president. And public opinion polls at the time were still giving Abe high marks, in part for the perception that he was effectively “handling” the US president—always an important task of the Japanese prime minister, and a factor in the high ratings enjoyed by Nakasone Yasuhiro (in his handling of Ronald Reagan) in the 1980s and by Koizumi Junichiro (in his handling of George W. Bush) in the 2000s. A Pew Research poll released on October 17 indicates that the Japanese public’s view of the United States and confidence in the American president have sharply declined since Trump took office, with 57% of Japanese seeing the United States favorably—down 15% from a year ago. Reflecting their declining opinion and their lack of confidence in the new US president, more than twice as many Japanese worry that the alliance between the two countries will deteriorate (41%) as believe the relationship will improve (17%) now that Trump is president. However, when seen from the Abe government, the relationship with the United States is going reasonably well (certainly much better than had been feared), in part because of the threat from North Korea, the economic initiatives undertaken by Japan, and the personal bond with Trump that Abe has assiduously cultivated. And from the viewpoint of strengthening Japan’s military capabilities and revising the Constitution, Trump may prove to be Abe’s strongest foreign supporter. Revising the Constitution, especially Article 9, is not an easy task, given the historical inertia, public opinion, and legal hurdles that need to be overcome to accomplish it. But Abe may face the most hospitable environment to do this in the 70 years since the current Constitution was enacted. First, the recent election has given the ruling coalition of the LDP and Komeito a more than two-thirds majority. If one includes members of the POH and the Japan Innovation Party, approximately 80% of the members of the new Lower House are in support of Constitutional revision. Second, Trump’s position has been that the United States is too “crippled” to take care of the defense of its allies, that the allies should stop “free-riding” on a United States that cannot afford it and rather fend for themselves. This is perfectly consistent with the views of those including Abe who would like to strengthen Japan’s military capabilities, both because Japan should become a “normal nation” that has its autonomous military capabilities and because the United States may no longer be a reliable partner that can come to Japan’s defense. Third, North Korea and China are the two adversaries of Japan that require the most attention, with the former being viewed as an immediate threat and the latter as a longer-term problem. For Abe to accomplish his goal of revising the Constitution, especially in the four years he may remain as prime minister (assuming he seeks re-election next year to a third three-year term as president of the LDP and hence stays as prime minister of Japan until 2021), how he deals with—or uses—the threat from North Korea may prove to be decisive in whether he can persuade the Japanese public to support his efforts to revise the Constitution. In this sense, Kim may be indispensable for Abe to accomplish the important historical task handed down from his grandfather, Kishi Nobusuke.